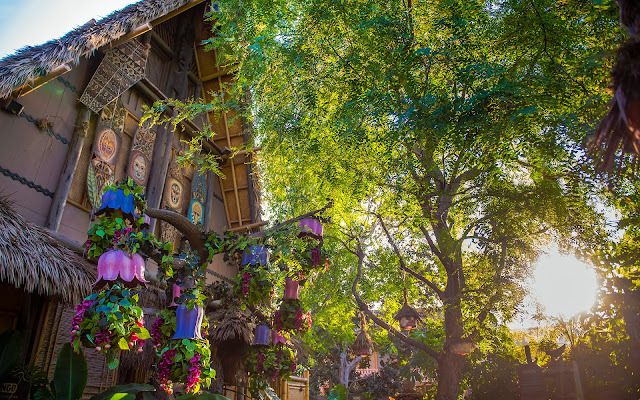 The Enchanted Tiki Room is a classic at Disneyland Park. Home to the first Disney audio animatronics, it's a lush and charming tribute to all things Pacific Islands, especially the Hawaiian Islands. Outside, the ambiance is particularly tropical. Between the deliciousness-dispensing Dole Whip stand across the waiting area and the animatronic figures of famous Hawaiian deities, the waiting area for the show is filled with flourishes to our nation's 50th state and its beautiful nature. And whenever I'm here, I always feel a strong yearning to go back and visit Hawaii. I suppose that's the point, isn't it? Paradise sure is alluring! Sunset behind the Enchanted Tiki Room.